Neanderthals did a surprising number of smart, human-type things before us humans ever got round to them. They showed us up at everything from making specialised tools to manufacturing jewellery1. Now we’ve found that Neanderthal cave art came before our wall paintings as well2. 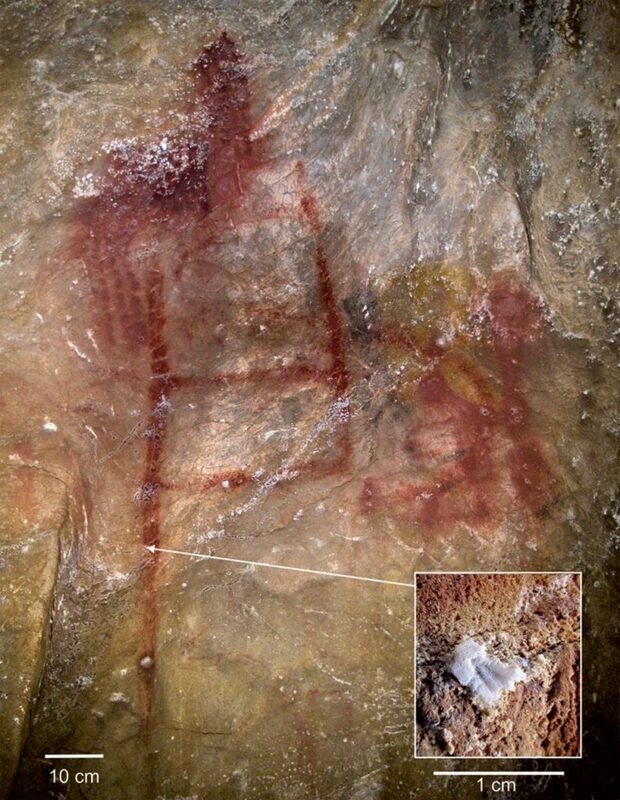 New ages for art from several Spanish caves show they’re at least 64,000 years old. That’s nearly twice as old as any modern human in the area, confirming they were made by the Neanderthals living there before us2. So what drove the Neanderthals to make art so early? The Spanish caves in question are La Pasiega, Maltravieso, and Ardales. Now, the discovery of art in those caves isn’t really a new thing. We’ve known about that for a while (in the case of La Pasiega, since 1913)2. However, proving who made the art is more challenging than simply finding it, since both Neanderthals and humans lived in the region. That said, Neanderthals and humans did live there at different times, so if we could date the art we can figure out whodunnit. Unfortunately, dating cave art is notoriously difficult. For instance, Radiocarbon dating only works on stuff that was once alive, like rocks and paint aren’t. As such, it should come as no surprise that ~95% of cave art in Europe hasn’t been directly dated3. Fortunately, these caves are the exception, rather than the rule, as they can be aged by uranium-thorium dating. This technique dates the age of calcium carbonate deposits – like stalagmites, stalactites, and flowstones – that form over the top of cave art. This provides a minimum age for the art. If the drawings were also made on such a deposit, that can be dated too to give a maximum age of the painting. 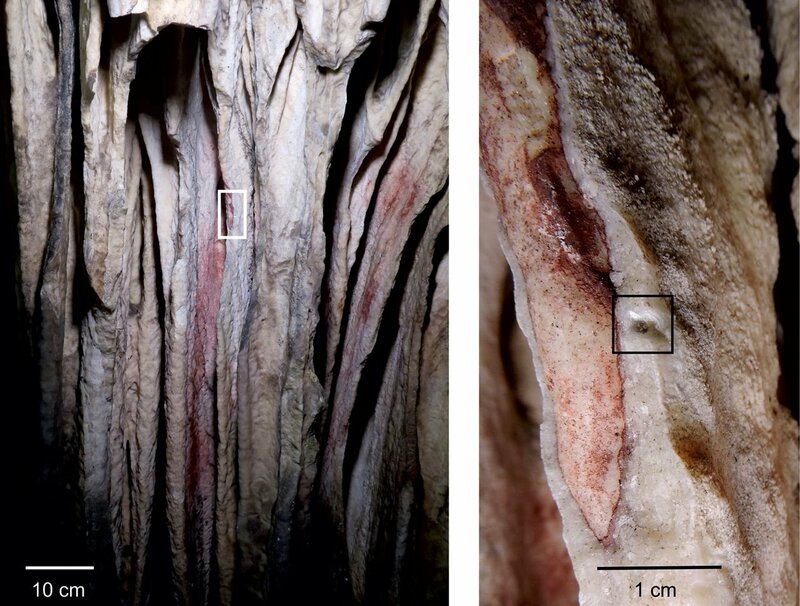 This method revealed that the cave art in La Pasiega, Maltravieso, and Ardales is all >64,000 years ago (except for Ardales, which also had a later period of painting a few closer to 50 kya). 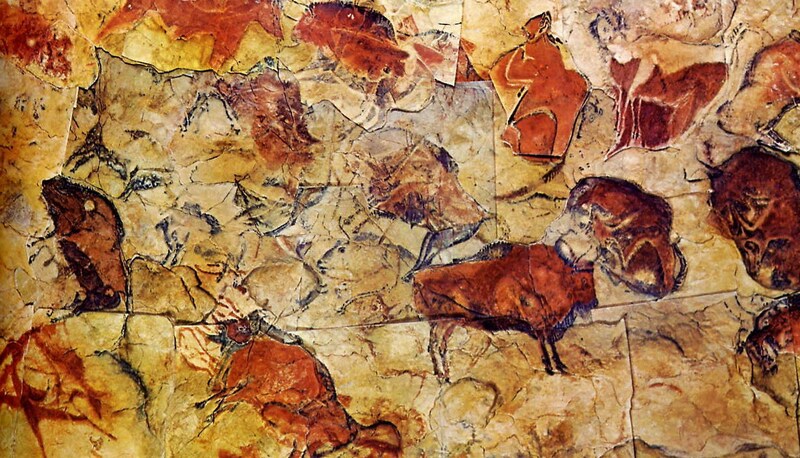 This places these examples of Spanish cave art firmly in Neanderthal times, roughly 20,000 years before humans arrived in the region2. So, now we know that Spanish Neanderthals were accomplished artists, I’m sure you want to know what they were actually making. Maltravieso is the site of the oldest art, with a minimum age of 66,000 years old. As such, it’s also the most damaged. It’s hard to make out exactly what Neanderthals were painting there with the naked eye. Colour correction reveals it was a hand stencil2. Next oldest is Ardales, where painting took place at a few different points in history. The oldest (and thus confirmed Neanderthal) set of art is at least 65,000 years old. That art is a series of stalactites that were painted red. Just big, splotchy red patches2. Finally, there’s La Pasiega which is the youngest set of Neanderthal cave art found, being a made mere 64 kya. It’s also some of the most complex art of the bunch, featuring an elaborate series of grids, lines, and dots2. So, now we know that Neanderthal cave art is a thing. And that they had a variety of styles. However, you might notice that one consistent theme is there are no representative images. No animals, plants, or people are depicted. This stands in contrast to some of the famous modern human cave art made later. This raises some questions, as many popular theories for why stone age people made cave art explain the images that depict something real. For instance, some argue that the images of animals were a sort of “prehistoric encyclopedia”. Later human art. Note: Animals. Lots and lots of animals. So some researchers have been trying to explain why Neanderthals were making this earlier, more abstract art. The gist of their new idea is that cave art is essentially glorified pareidolia. People would spot bits of caves that reminded them of people, places, or animals and draw on them to clarify an image. A bit like spotting the face on Mars, then drawing over it to highlight its features4. In early cases, like with the Neanderthal cave art, they claim people were focusing on bits of the cave that was like their own body. This abstract art, they suggest, represents fingertips and hands, motivated by Neanderthals spotting bits of a cave that reminded them about fingertips and hands4. Sounds like nonsense? Well, that’s just one team’s explanation. Maybe Neanderthal art was actually symbolic, or a calendar. The list of possibilities goes on, and I suspect we’ll never know the answer. We are, after all, trying to get understand the motivation of another species. We have enough trouble trying to figure out what other humans are up to. One thing we can say for sure is that Neanderthals were artists. And they did it before us. Hoffmann, D.L., Angelucci, D.E., Villaverde, V., Zapata, J. and Zilhão, J., 2018. Symbolic use of marine shells and mineral pigments by Iberian Neandertals 115,000 years ago. Science advances, 4(2), p.eaar5255. Hoffmann, D.L., Standish, C.D., García-Diez, M., Pettitt, P.B., Milton, J.A., Zilhão, J., Alcolea-González, J.J., Cantalejo-Duarte, P., Collado, H., De Balbín, R. and Lorblanchet, M., 2018. 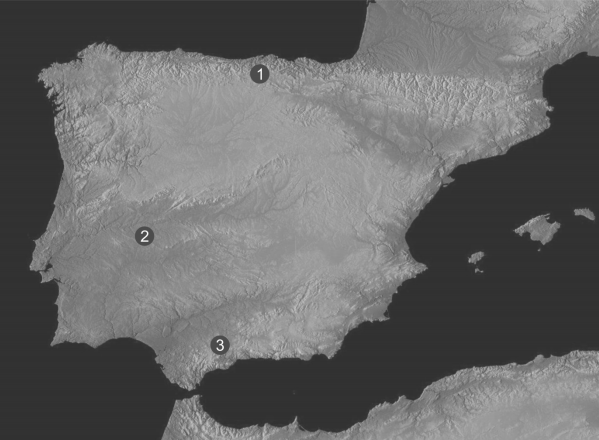 U-Th dating of carbonate crusts reveals Neandertal origin of Iberian cave art. Science, 359(6378), pp.912-915. Pettitt, P. and Pike, A., 2007. Dating European Palaeolithic cave art: progress, prospects, problems. Journal of Archaeological Method and Theory, 14(1), pp.27-47. Hodgson, D. and Pettitt, P., 2018. The Origins of Iconic Depictions: A Falsifiable Model Derived from the Visual Science of Palaeolithic Cave Art and World Rock Art. Cambridge Archaeological Journal, pp.1-22. could very well be descendants of Naledi ? It would be more than interesting to know what bodily similarities there are between the original inhabitants of the Amazon and the San, if any ? Another interesting question is whether the early Sapiens could have interbred with the later Erectus that apparently also still lived here at the times Sapiens already seemed to be around. If Sapiens was around at 300,000 years their linage would have been running around Africa a long time before that as, as we know, evolution is a rather slow process ? These modern high tech brain analysis could very well supply the answers ? With Naledi also around at the same times, this makes possibilities, probabilities ? Especially in the light of the naughty behavior of the Neanderthals and Sapiens in liberal Europe. Africa would not have wanted to have been seen as ” behind the times ” then. Are there studies on the net to be read on this ? It’s extremely unlikely that any modern populations are the direct descendants of H. naledi given that they post-date the emergence of our species.